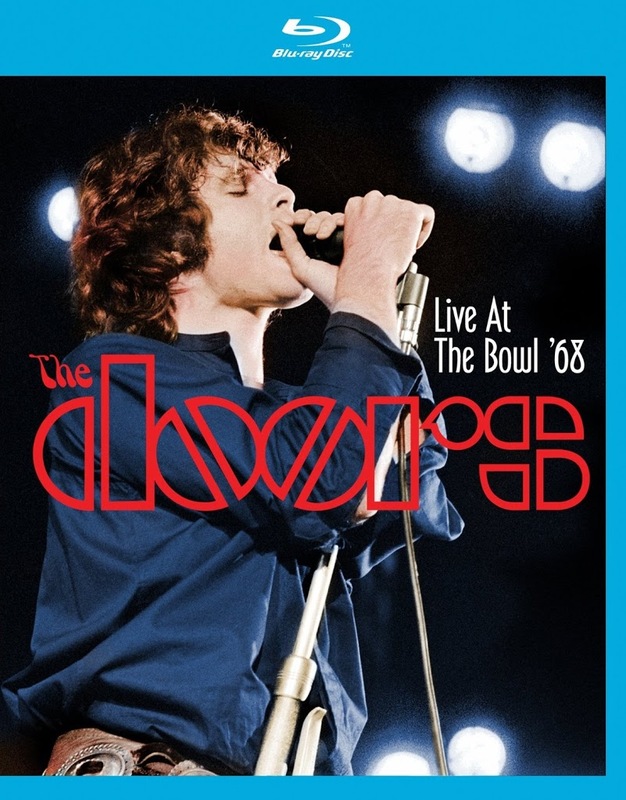 Article first published as Music Blu-ray Review: The Doors – Live at the Bowl ’68 on Blogcritics. However much acid Jim Morrison dropped before The Doors’ celebrated Hollywood Bowl performance on July 5, 1968, it wasn’t enough to result in a loss of focus or intensity. Sure, Morrison seems to become increasingly heavy-lidded and generally out of it as the show progresses, but he remains magnetic from start to finish. Eagle Rock Entertainment has issued a restored and expanded version of the concert, Live at the Bowl ‘68, complete with numbers previously unseen due to audio problems inherent in the original soundboard recordings (more on how they circumvented that later). The band rehearsed for the show and seems well prepared, regardless of whatever state of mind Morrison was in. They open and close with their twin epics, “When the Music’s Over” and “The End,” respectively. These lengthy pieces allow for plenty of instrumental interplay, ranging from somewhat tedious (Ray Manzarek’s sometimes clumsy organ soloing) to quite engaging (the mostly fluid guitar leads by Robby Krieger). These guys were never quite rock’s equivalent to a great modal jazz combo, but their flair for the dramatic was consistently arresting. Morrison draws laughs from the crowd at various times, including the cheesy firing squad routine during “Unknown Soldier” and the improvised “Ode to a Grasshopper” bit in “The End.” The show hits the doldrums at the midway point with a series of lesser tunes (“A Little Game,” “The Hill Dwellers,” “Spanish Caravan”). Most of the time, however, The Doors are at the top of their game. “Moonlight Drive” grooves along slinkily, the “Back Door Man/Five to One” medley rocks, and “Hello I Love You” bounces along aggressively. Apparently considerable work went into the visual restoration of Live at the Bowl ‘68. The 1080p AVC-encoded transfer is by no means difficult to watch. The troubling aspect for me was the overall lack of texture. This is a very smoothed out image, missing the natural film grain one would expect (especially from footage of this vintage). I’m guessing noise reduction was quite liberally applied. Sharpness and fine detail are a bit lacking overall. That said, the image is extremely clean, free of dirt, scratches, or other distracting artifacts. The reason to pick this up on Blu-ray is the 5.1 DTS-HD lossless soundtrack. While the surrounds are not terribly active, reserved mainly for audience noise and some bleed-over of John Densmore’s drums, the sound field is very impressive. 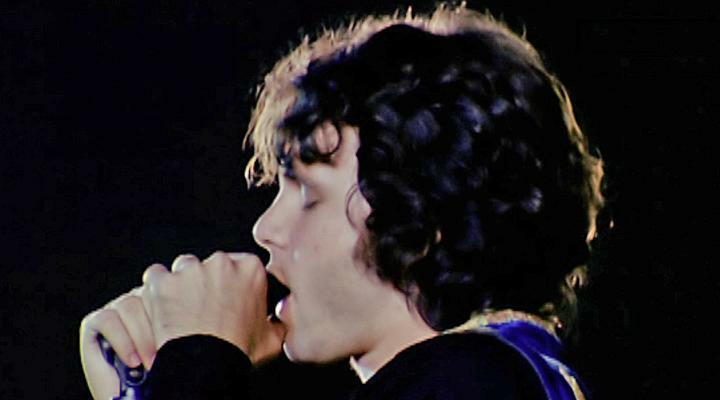 Morrison’s centered vocals are crisp and realistically full-bodied. Each instrumental element is well-defined. When Krieger flubs a riff, you’ll notice it (not to say that it happens too often). I was particularly impressed with the clarity of the drums. If anything, the mix is a little light on the bass end, but overall the work done by the audio department is outstanding. Live at the Bowl ‘68 comes fairly well stocked with around an hour of supplemental features. The best of the bunch are the three newly produced featurettes that include new reflections from all three surviving Doors. “Echoes from the Bowl” is a 20 minute piece that offers a lot of information about the Hollywood Bowl itself. “You Had to Be There” runs 19 minutes and details The Doors’ road to the Bowl. In an amusing variation of the old Carnegie Hall line, Manzarek asks, “How do you get to the Hollywood Bowl?” before quickly answering, “By limo.” Members of The Chamber Brothers, one of the support acts for the show, are also on hand to reminisce. The featurette on the audio and visual restoration is a fascinating look at the immense effort that went into presenting the full length concert. This is where we learn how the complete concert was edited together for the first time, despite problematic 44-year-old master tapes. A few songs, including “Hello I Love You” and parts of “When the Music’s Over,” were either missing Morrison’s lead vocals or badly marred by static. Audio engineer Bruce Botnick is upfront about the “cheating” that was necessary, demonstrating how alternate vocals (taken from other shows) were used for to fill in where nothing usable existed. While it isn’t a “pure” representation of the Bowl gig, it’s a compromise that works well. I didn’t know about these issues prior to watching the featurette and would’ve never guessed based on the seamless audio presentation. For those longing to jump back to the late-‘60s and witness one of the era’s most seminal bands at their prime, Live at the Bowl ‘68 is the closest anyone’s going to get. Fans of The Doors will likely be grateful for the opportunity.